*BigDye is a registered trademark of Thermo Fisher Scientific Inc.
HighPrep DTR is a high performance paramagnetic bead-based system, designed to remove unincorporated dye terminators from Sanger sequencing reaction. 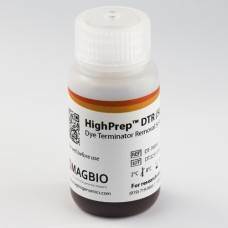 The HighPrep DTR system consists of a selective binding of DNA to the HighPrep DTR paramagnetic beads, followed with washing off nucleotides, primers and non-targeted amplicons, and finally elution of pure DNA. HighPrep DTR is designed for both manual and fully automated purification of sequencing products. The protocol can be adapted to your current lqiuid handling workstation utilizing your current protocol. For research purposes only. Not for use in diagnostics procedures.